Distinguished guests gathered for a special luncheon at South Shields Town Hall to mark the retirement of the Lord Lieutenant of Tyne and Wear, Sir Nigel Sherlock KCVO OBE. Sir Nigel is stepping down from his role in early January next year after 14 years acting as Her Majesty's representative of Tyne and Wear where his main role has been to uphold the dignity of the Crown. In his role as Lord Lieutenant Sir Nigel arranged Royal visits and escorted members of the Royal Family, presented a number of honours, medals and awards, swore in new magistrates and liaised with local units of the Armed Forces. Among the guests at the lunch were the Mayor and Mayoress of South Tyneside, Councillor Fay Cunningham and Stella Matthewson, businesswoman Dame Margaret Barbour and eminent Professor in Archaeology, Dame Rosemary Cramp. 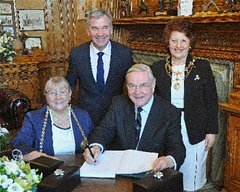 The Mayor said: "It was a pleasure and a privilege to be able to honour Sir Nigel with a civic luncheon and bid him a fond farewell. "It was a lovely opportunity to wish him all the best for a long and happy retirement."